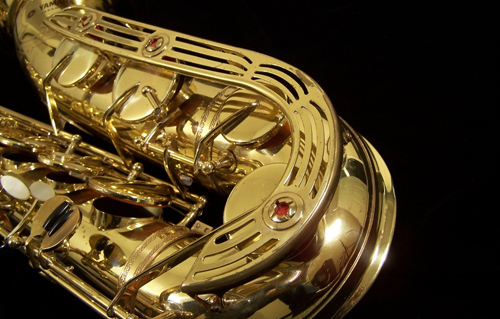 From 1974 through 1984 Yamaha created what I and many others consider one of the best baritone saxes ever created. It’s tone is clean, clear and with minimal coloring from the horn. Simply put this horn and all Yamaha horns from this point forward, allows the saxophone to sound like the musician playing it. With a Yamaha you can sound like yourself and in turn develop a unique sound that is identifiable. Many other baritones have a strong inherent tone that can be colored by the musician but will always sound like itself. Conn 12m and Selmer Mark VI’s tend to have “the tone” and is usually identifiable as what it is regardless of who’s playing it. Mind you there’s nothing wrong with that if it is a sound that you like but Yamaha gives their players blank slates to paint with. The YBS-61 and subsequent models all feature Yamaha’s nearly perfect ergonomic keys system. From the location of key touches, side keys, and palm keys to neck angle and low-a key placement, Yamaha set the standard for playability. If you’ve ever played a vintage Conn 12M then you too must have wondered just how large of hands people in the early part of the 20th century had. The key touches are nowhere near comfortable for people with average hands let alone children or smaller adults. The key touches are aligned in an almost straight line which is in no way ergonomic. The palm keys touches are no better either. The are all in the same plane which doesn’t match the natural arch of the hand while playing. Let’s not forget the right hand side keys. The high F/Eb key is flat across its touch and provides no natural resistance to movement across it’s face. This means you can easily overshoot it during a particularly difficult passage. It should be said that few of these particulars are unique to vintage baritones. Virtually all vintage horns has one or more of these issues from the 1910’s through 50’s. Some manufacturers started addressing ergonomics earlier than others. That said, Yamaha really has set the standard for quality key work and excellent tolerances. Currently it’s all the rage on Chinese import baritones to add double key arms to the low notes from low C down to low A. Yamaha’s key design is very strong and thus requires no double arming to get the required strength not to flex when in use. When in proper adjustment Yamaha low A mechanism is robust, light, and very quick despite have multiple points of motion. 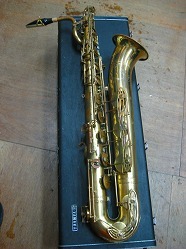 In later models Yamaha would adopt the double arm on the low C which it appeared to have borrowed from Yanagisawa horns. All of this praise does not come without some condemnation. While the horn is well made and functions beautifully the same cannot be said for the case. As you might already know, time is the true test of any design, and the case latches failed. The weight of the horn is enough to make the latch screws pull through the case material. Without a backing plate the latches and handle were eventually going to give in to the inevitable pull of gravity. While the latches/handles represent a functional issue my only other complaint is that where they give you lots of room to store items within the case they did not include overs for the various compartments. If the item you place in the compartment is not snug then it may very well end up in the bell. There’s nothing quite like fishing a mouthpiece cap from the body of you horn during warm up for a gig. The horn is not without its share of problems, some more nit picking than actual. First is the lack of coloration of the tone. While for some this blank slate offers infinite possibility for others it is the polar opposite. They complain that the Yamaha has no soul or personality. They wax poetically about the 12M’s gutsy tone, the Buescher 400’s Deep bottom end, or the Selmer’s sonorous middle and top register while accusing the Yamaha’s tone of being very vanilla. Are any of these assessments correct? It’s up to the player to decide. Structurally the -61 has some shortcomings. The sheet metal guards are somewhat soft and easily bent with even a slight knock. I get that the guard is supposed to absorb impacts but it seems a bit too soft. The palm key heights are not adjustable on any Yamaha saxophone. This has been a common feature on Keilwerth horns for years and would facilitate better form for players with larger hands. lastly the largest and most egregious fault in the early YBS-61’s is the lower octave vent. The lower octave vent, the vent which opens between the A and G break, is in the wrong location. The as-built location on the body 1/4″ down from the top main body connection does not allow the A,G#, G notes to speak cleanly in the second register. One or more of these notes will feel hesitant or sound slightly fuzzy because of this. Some players claim not to have this issue on their horns while others, like myself, are always aware of this issue when we play. To show how big of a problem this was; Yamaha fixed this problem about halfway through production of the -61. Still to this day they reference those modifications to new baritones like the YBS-62. Here’s Yamaha’s description from their website for the YBS-62: “A feature exclusive to Yamaha saxophones, the three-vent octave mechanism eliminates fuzzy, unclear tones when playing G, G# and A with the octave key..” This is the problem and there are many early -61’s still out there playing that could use this repair. Sadly any repair tech unaware of this flaw might be on a wild goose hunt and some owners paying a tech of exploratory exams when the problem is much more fundamental. The repair involves moving the octave vent and plugging the original vent. I’ve heard from some who’ve had this done that the repair absolutely repaid the issue but I’ve also heard from Yamaha themselves that there is no guarantee that this will fix any perceived deficiencies in the horn. Yamaha says this will having in it’s archive instructions for repair techs to make a retrofit and repair the horns. Good luck in getting a copy of this document as Yamaha customer service was not in any hurry to distribute this information. Yes, I said that Yamaha USA’s customer service was apprehensive to share information directly with me on how to correct a design flaw on my 40 year old horn. More on this later. TAKE AWAY: All things considered I really enjoy my YBS-61. Any mouthpiece, any reed, any musical genre, and any tonal concept can be achieved at any time by this versatile model. If modern Yamaha baritones are 1/10th as versatile as the my old -61 then I can’t wait to get my hands on one. Image above from Kessler Music check them out.